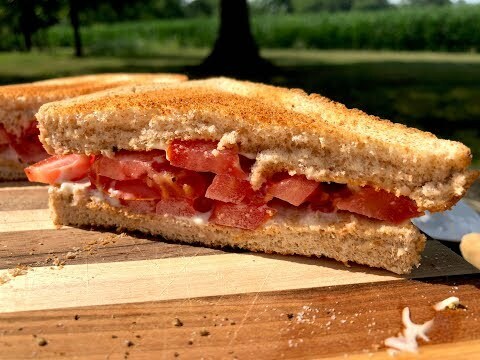 The toasted tomato sandwich brings us back to a simpler time. A time before algebra and toilets. Back when things were easy. A time when character was built from hard work and hard knocks. Out in the country, where tomatoes come from. In a field, with the simple tomato. you can get them at a roadside stand. which starts with whole wheat. and leave it under the strong crisp light of the moon for three lonely nights. Tie up the end then sell it to your neighbor as a pillow. 500 watt galvanized steel nichrome wire lateral current low impedance split phase omnidirectional quad voltage wide arc triple coil toasting machine. Powered by an 8,000 horsepower truck. from the power of heat and fresh country air. until it's exactly a quarter of a half inch thick. forged from a hunk of carbon stainless meteorite iron. And trade it for an equal amount of salt. Then sprinkle that onto the tomatoes. with your spike and rail. the presence of the Illuminati. th͟e͝ ̀pres̨en͢ce̴ ͟of ̴t͏h͞e I̵l͢l҉umi̧nati̸. down a lonely road, and across the beans. when the toast was crisp. and now you're paying the price. Tell yourself you'll do better next time. Out here in the country.